Bread's interior softness, or crumb, mainly depends on gluten development. 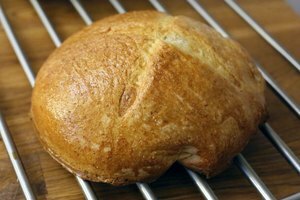 Bread produces carbon dioxide during baking, resulting in bubbles that give it an "airy" crumb. If the gluten is underdeveloped or overdeveloped through improper kneading or rise, you'll have a dense, chewy loaf. You can also create a softer crumb using low-protein flour. Create a soft exterior, or crust, with the addition of fat, post-baking steam or milk. A lidded bread pan, known as a Pullman loaf pan, also keeps the crust to a minimum. Bread uses a 5:3 ratio of flour to water. Too much flour makes a dense loaf, so you must measure your ingredients accurately; a digital scale is far more precise than measuring cups. 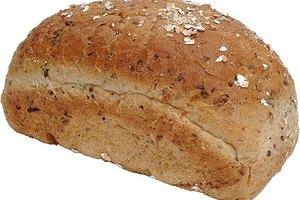 For one loaf of bread, the ratio translates to 20 ounces of flour, 12 ounces of water and 7 grams of yeast. By volume, you need 3 cups of flour, 1 cup of water and 1 teaspoon of yeast per loaf. 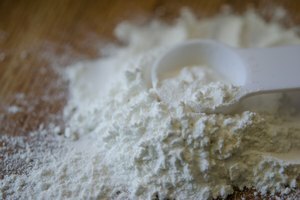 If you're using measuring cups, don't pack the flour; add it to the cup using a spoon and scrape the excess off the top using the back of a knife. 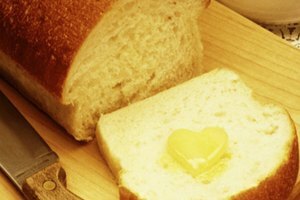 After you have the basic bread ratio down, use one or two of the following techniques to encourage a soft loaf. Milk inhibits gluten development and helps produce a softer crumb than water. Replace half the water in the bread recipe with milk (skim and whole milk both work) and use hot water. Like milk, fats -- such as egg yolks, butter or oil -- inhibit gluten development, resulting in both a tender and moist crumb. Add fat when you add the water to the flour. Add 2 egg yolks per loaf of bread for a rich flavor, tender bite and moderate moistness. In a standard bread recipe, use 3/4-cup of water and add 2 tablespoons of oil or butter for a soft texture and very moist crumb. After baking, lightly brush the top of the loaf with butter or oil to prevent the crust from toughening. Water roux, or tangzhong, is a additive used as a starter and dough conditioner in Asian breadmaking. Tangzhong gives bread a light, airy crumb and longevity. Breads made with tangzhong stay soft for about three days. For each loaf of bread, mix 2 cups of water with a little less than 1/2-cup of flour. Bring the mixture to a boil, whisking frequently to dissolve the lumps. When the tangzhong thickens -- when a spoon passed over the surface leaves tracks -- take it off the stove and let it cool. Replace up to 5 percent of the flour in your bread recipe with tangzhong. Kneading is crucial to proper gluten development. You usually don't have a problem with over-kneading if you knead by hand. It's quite easy, however, to over-knead when using a stand mixer. After baking and while the bread is still warm, wrap it in a layer of aluminum foil or plastic wrap. The bread will steam from the residual heat and soften the bread. Storing bread in a plastic bag keeps it soft for a couple days longer than when kept unwrapped or in a breadbox.